CityFloodMap.Com: Are Six 100 Year Storms Across the GTA Rare Over a 14 Year Period When Considering Probabilities of Observing Extremes at over 150 Rain Gauges? in a single year is like. While we are all concerned about flooding, the question on large storm frequency is "So What?". Or more specifically, from a statistical, mathematical, logical point of view, is more than five 100 Year storms over a 14 year period (2005 to 2018) rare and unexpected, or does this have a high probability of occurring? 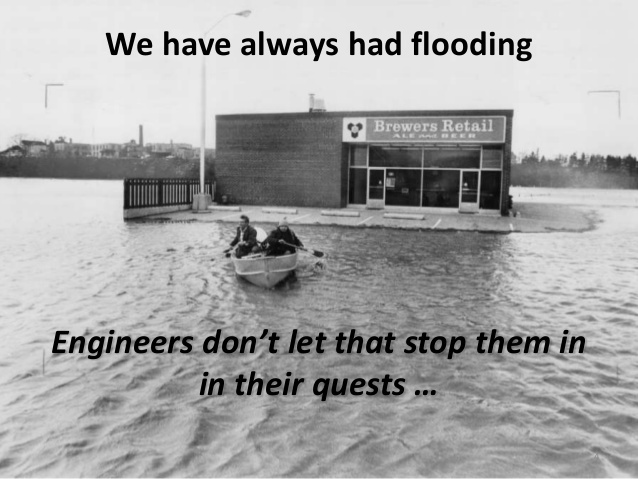 As we know the Insurance Bureau of Canada does not always rely on proper statistics to support statements on extreme weather, confusing theoretical shifts in probabilities of extreme events with real data (see IBC Telling the Weather Story where IBC ignores Environment and Climate Change Canada's Engineering Climate Datasets). Let's do some math to see if over five 100 Year storms is rare or not. First, consider that a 100 Year storm has a probability of occurring of 1/100 = 1 percent per year. Total number of gauges = 151. A good first estimate - certainly there are more. Third, assuming each rain gauge observes rainfall events independently year to year, what is the chance of getting at least one 100 Year event at a single gauge in 14 years? Probability = 1 - (1-1/100)^14 = 13.1% chance of a 100 Year storm storm at a single gauge. That seems pretty big. 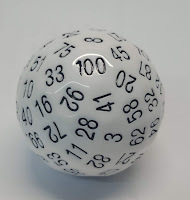 The number of 'trials' or samples equivalent to 14 rolls of a 100-sided die, meaning 14 independent observations or 'samples' from the statistical population of events. It is reasonable to assume that a single rain gauge can record a 100 Year event but not surrounding gauges? Yes indeed. The August 2018 storm in Toronto only exceeded 100 Year rainfall totals at one gauge. So it is reasonable for smaller, spatially isolated rainfall events that do occur. Fourth, assuming all rain gauges observe rain independently what is the chance of getting more than one 100 Year events across all 151 gauge in 14 years? Probability = 1 - (1-1/100)^(2114) = over 99.9% chance of at least one 100 year storm at 151 independent gauges. That is almost a certainty. (Additional comment: we know that storms exceeding 100 Year volumes can cover large areas such that observations are adjacent gauges are not completely independent, especially if they are spatially very close - so this fourth scenario is considered an upper bound on sensitivity analysis considering gauge independence - below, another bound is evaluated assuming less independence). 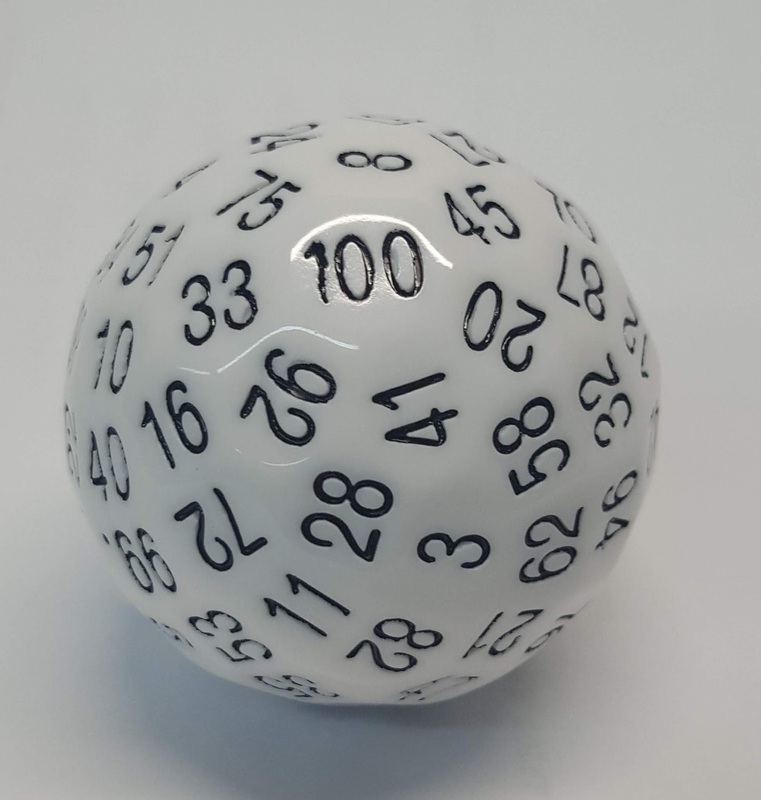 The probability of 5 or more 100 Year events is again over 99.9% (see cell F22), showing that when there are many, many trials, the probability of a multiple rare event is very high. Fifth, assuming large storms cluster across several gauges and they do not operate independently from each other for extreme events, and that say they observe 100 Year storms in groups of 5, what is the chance of getting one 100 Year event across 151/5 = 30.2 rain gauge clusters in 14 years? Probability = 1 - (1-1/100)^(422.8) = over 98.5% chance of at least one 100 year storm at 30 independent gauge clusters. Near certainty. Not rare at all! Let's consider over five 100 Year storms again. A keen reader has shown that the probability is 41.6% for this, as shown in cell L22 in the spreadsheet image above. Again,pretty high chance of getting 5 or more events when gauges do not observe extremes independently, but rather in clusters. There are more rain gauges in Durham Region and other Conservation Authorities in the GTA which means there may be more than 30 clusters to observe extreme weather in, meaning an even higher probability of observing extreme events. The August 7, 2018 flood in Toronto was due to only one Toronto rain gauge in the Open Data dataset exceeding 100 Year volumes. Therefore, assuming a cluster size of 5 dependent rain gauges within independent clusters that observe extreme events seems quite reasonable. Conclusion - is it not rare to get more than five 100 Year rainfall observations at over 151 GTA gauges, over 14 years. The chances range from near certainty (over 99.9%) for independent events at each rain gauge to relatively high probability (over 40%) if gauges are independent clusters of 5 or more. So what else does that tell us? There is a tendency to exercise an 'availability bias' in the words of Daniel Kahneman, and ignore statistics when making quick observations about extreme events. A description of this and other "Thinking Fast" heuristic biases surrounding flooding and extreme weather is in this paper. Most media reports seldom "do math" and echo sources without question many times - that was the finding of the CBC Ombudsman on this topic of more frequent or severe extreme rainfall recently - see Ombudsman ruling. Its one thing for a reporter to echo IBC statements on extreme weather for a news story, but Toronto should be careful in taking on a court case with limited data - it would be great to see any IBC statistics or analysis (unlike in the Telling the Weather Story communications). 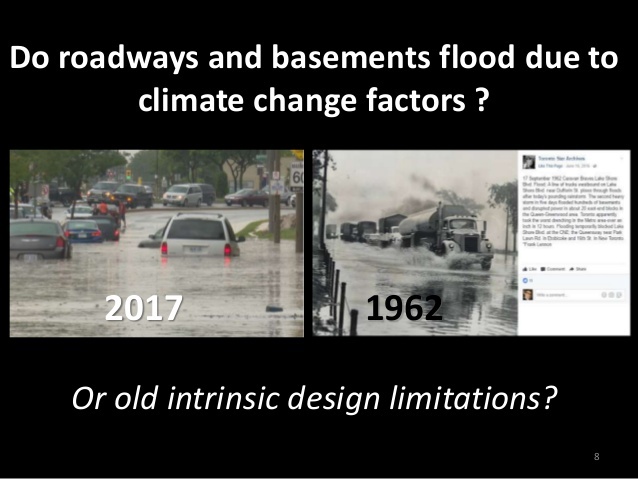 Toronto should also be aware that its flood problems are due mainly to its own design standards in the original size municipalities dating back before the 1980's. Spatial analysis shows that is where the risks are and where the flood reports are being made to the City of Toronto - see slide 36 in this review of flood risk factors which clearly do not include more extreme weather - partially separated systems have the highest risk and Toronto has allowed development to occur without mitigating risks in the past (hence the famous Scarborough Golf court case decision against municipalities for gaps in their stormwater management practices (Scarborough Golf Country Club Ltd v City of Scarborough et al)). Same thing on other GTA cities - see slide 7 in this presentation to the National Research Council's national workshop on urban flooding February 2018 for flood vulnerabilities in the City of Markham - see where Mississauga flood calls occur in this previous post (more than half of flood calls are in pre-1980 areas designed with limited resiliency for extreme weather). .. as shown in a previous post. These 5 minute 100 Year intensities have dropped between 4.0 % and 8.1% between 1990 and 2016-2017 depending on the location. Such decreases in short duration intensities are happening across southern Ontario as well, based on the newest Engineering Climate Datasets as shown here. Toronto should be careful in preparing for a legal challenge and any claims on flood causes. Terence Corcoran covers this all very well in today's column, referencing analysis on this blog. Note: probabilities for 5 or more events corrected/updated April 1, 2019. Thanks to keen readers for helping define the probabilities of combination events and for the nostalgic references to University of Toronto's Professor Emeritus Dr. Barry Adams' CIV340 course notes that outline the analysis approach.